The UC Santa Cruz Arboretum will hold its annual Spring Plant Sale on Saturday, April 9, from 12 noon to 4 p.m. at the Arboretum's Eucalyptus Grove on High Street near the intersection with Western Drive. The sale offers a wide range of colorful, water-wise succulents, small trees, and other plants from Australia, New Zealand, South Africa, and California. This year, many of the featured plants attract birds, particularly hummingbirds, and most of them can't be found at local nurseries or elsewhere in the state. Gardening experts are available at the sale to answer questions about plants and offer advice to ensure they thrive. Food and beverages will also be available for purchase. Arctostaphylos insularis 'Ward': A native manzanita from Santa Cruz Island and a great plant for hedges and landscapes, Arctostaphylos insularis is a shrub that grows 6 to 12 feet in height. It flowers from winter into spring and produces pinkish-white flowers that nicely accent the mahogany bark and green leaves. Prostanthera baxteri 'Lavender Moon': An evergreen shrub native to Australia, Prostanthera baxteri produces silver-green leaves and colorful purple flowers that bloom in the spring. Ideal conditions for the plant are in sunlight or slight shade. It grows to 3 to 4 feet. Boronia crenulata 'Rosy Splendor': An aromatic Australian shrub, Boronia cenulata 'Rosy Splendor' came to the Arboretum by way of the Koala Blooms program, a partnership between the Arboretum and nurseries to bring native Australian plants to California. Boronia crenulata is ideal as a container plant and can be used as a border plant or in rock gardens. 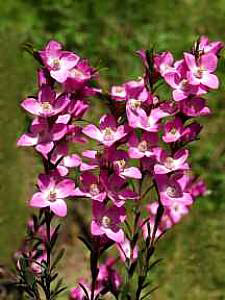 It will thrive in either direct sunlight or dappled shade and produces bright pink flowers that bloom in the spring. 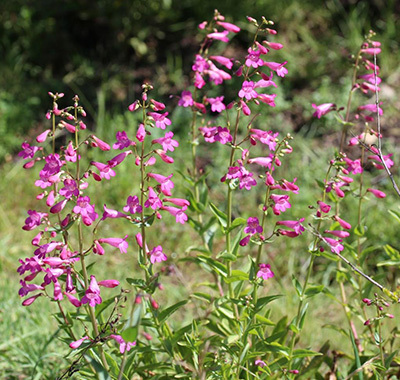 Penstemon spectabilis: An evergreen perennial native to California, Penstemon spectabilis grows to a height of about 3 feet and produces violet flowers which bloom from spring to summer and attract hummingbirds. It is a drought tolerant plant that does well in sun or partial shade. 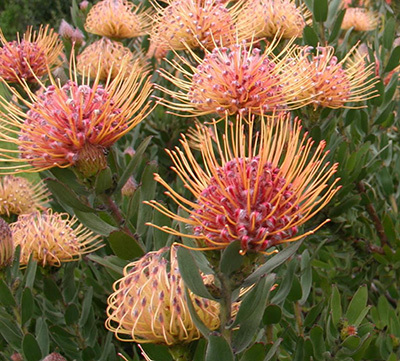 Leucospermum 'Spider': A large shrub native to South Africa, Leucospermum produces eye-catching "pincushion" flowers that bloom in the early spring to summer months. It does well in full sun and is drought tolerant. It can be pruned to maintain a smaller size. The bright flowers are a salmon color with red and orange tipped stamens that will add a pop of color to any garden. The annual event is made possible by the tireless efforts of Arboretum staff organizers and hundreds of energetic volunteers who work all year growing the plants. "Our plant sales are a cooperative adventure between the Arboretum's fine staff and wonderful volunteers. The sale would be almost impossible to hold without the hard work of all of us," said Phyllis Norris, a long-time volunteer. As in previous years, the Arboretum's plant sale is a joint event with the California Native Plant Society (CNPS). For Arboretum and CNPS members only, the sale opens at 10 a.m. on Saturday, April 9. The public sale starts at noon. Memberships can be purchased online before the sale or at the gate on the day of the sale. For more information, contact the UCSC Arboretum at (831) 502-2998 or visit arboretum.ucsc.edu. The Arboretum is open from 9 a.m. to 5 p.m. every day. Norrie's Gifts is open daily from 10 a.m. to 4 p.m.